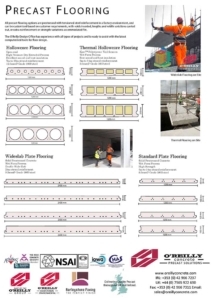 O’Reilly Wideslab floors are Precast and Prestressed flooring elements which allow faster installation, less joints in flooring, and a smooth soffit finish. O’Reilly Wideslab panels differ from normal plate flooring by their extra width – 2.4 metres as opposed to 1.2 metres for our standard plate flooring product. Like the rest of the O’Reilly range they maintain excellent quality and strength characteristics, but are more convenient to install, allowing cheaper, faster erection with less joints to worry about. They are suitable for all uses, but particularly suited to larger commercial developments. All floors consist of a solid prestressed slab acting as fully participating formwork which may be propped or unpropped depending on design requirements and which act compositely with an in situ topping to form an efficient structural section. When grouted, the shear key between adjacent wideslabs ensures that the individual slabs behave similarly to a monolithic slab. Our design office can help with designing your wideslab flooring plan, and as we cast our own product in a wet-pour process our wideslab flooring can be tailored to your project’s needs. Modular width of 2400mm reduces the number of joints and erection time.